Mr Inspector conducts pre-purchase building inspections in the Brighton areas. Mr Inspector who is qualified building inspector took this photograph during one of his building inspections in Brighton. It depicts an uneven roof line and you can see the cause being the removal of an underpurlin (horizontal timber member). The only way this could be found was by a thorough external roof and roof void inspection. The unevenness was only visible once you climbed onto the roof. This will be an expensive fix as additional support is required to prop the roof and is considered a structural defect by Mr Inspector. Mr Inspector says this defect is why people need to have their potential homes inspected by a qualified and experienced building inspector as this expensive defect would not have been found unless the roof space was inspected. Mr Inspector is a qualified building and pest inspector in Melbourne who took the above photograph during a building inspection in Bentleigh East. It depicts old timber stumps and off cuts being utilised to support a bearer. This does not comply with the Australian Standards for Residential Slabs and Footings Construction AS 2870-1996 and a stumping contractor is required to rectify the problem. Although not overly difficult to rectify this building defect you may notice some internal floor bounce or unevenness and over time you may get some internal wall and ceiling cracking. When Mt Inspector sees wall cracks internally, as was the case at this building inspection, it is important to be able to assess the sub floor to try and ascertain the cause of the problem. Mr Inspector is a qualified building inspector conducting building and pest inspection in the Bentleigh area. Mr Inspectors took the above photo during one of his many building inspections in Bentleigh. It depicts a timber floor frame member (bearer) that has been cut out to accommodate a pipe connection. Although this defect has not caused any internal floor unevenness or wall cracking the bearer is a load bearing timber member and cutting can weaken the structural integrity. It is technically a structural defect, however, due to the fact it has been like this for many years and not caused any further problems, Mr Inspector considers monitoring of the area only. The importance of a qualified building inspector conducting your house inspection is essential as experience and knowledge will detect issues and give you the right advice on rectification if needed. Mr Inspector is one of few qualified building inspectors doing building inspections in the Mentone area. The above photograph depicts the floor levels being slightly uneven during a building inspection in Mentone, Melbourne. It is important to access the sub floor during the building inspection to try to ascertain the cause of same. Sometimes it can be due to stump footing rot, poor re-stumping where they didn't level adequately or differential settlement in the homes footings system. Common causes of footings settlement are tree root problems, excess water draining into the sub floor from broken storm water pipes or down pipes not connected to storm water and poor drainage where the land outside the walls falls towards the home. Rectification of uneven flooring can as simple as packing between the bearer and the stump to level the floor to the more difficult and expensive task of having the home-re-stumped. Occasionally some house inspections we attend where exposed floor boards are evident show a 10 to 15 mm gap between the skirting board and the floor boards all throughout thehome. This can sometimes be due to the carpet being removed and thus the gap is now visible - especially if the same gap size is throughout the home. Having a qualified Melbourne building inspector from Mr Inspector ensures you will get the right answers to the defects located. Mr Inspector is a qualified building inspector conducting building and pest inspections in the Moorabbin area. Above is a photograph taken by Mr inspector during a building inspection in Moorabbin. It shows the floor was substantially uneven throughout the house and Mr Inspector had to dig under the home to adequately assess the condition of the stumps. As was the case here, uneven floors usually indicates a footings problem or stump rot. When the stump footings are rotten it is time to have the home re-stumped as problems will continue to arise like wall cracks, doors binding and uneven floors. 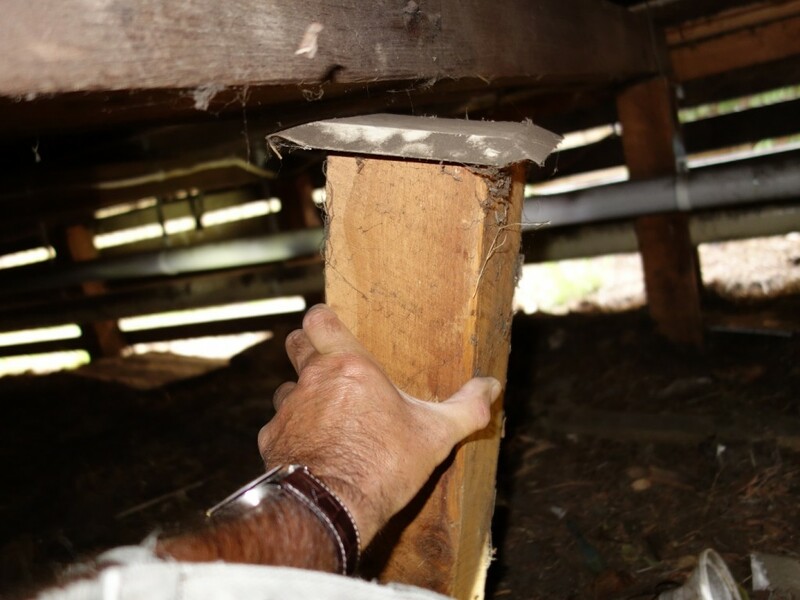 Some previous home inspections we have done in Melbourne reveal that stumps have been rotten for years. It is very important that a qualified building inspector assess the homes footings prior to purchase. If defects are found you may have the ability to negotiate a better price or you may decide not to purchase. If you don't have these areas inspected you may sustain substantial repair costs. It is extremely important to obtain a building inspector who is willing to carry out a thorough inspection of the homes sub floor as this is where Mr Inspector's qualified building inspectors come across the majority of major problems. After all, the footings are what is holding your house up and must be inspected. The above photo was taken by Mr Inspector during one of the building inspections in Gardenvale and shows that the stump footing was never footed properly as it could be moved and wobbled. Although relatively easy to have rectified, the symptoms of a poorly stumped home or decayed stumps may be bounce in the flooring, wall cracks, ceiling cracks and unevenness in the floor levels which means more expense for you. As one can see by the above photograph, a thorough building inspection involving assessing the sub floor is essential prior to buying a home. The photo above was taken by Mr Inspector, a qualified building inspector, during a recent building inspection in Oakleigh. It shows some brick mortar cracking on an external wall. Step cracks normally indicate some degree of differential settlement in the footings and the cause and remedy can be many. Cracks are classified into categories depending on location, size or width, shape and number of cracks. Cracks found during Mr Inspectors Building Inspections are categorised depending on the widths and the severity. Some can be due to minor differential settlement and others can be due to other major problems int he homes footings. Internal cracks can be due to the footings having deteriorated, for example the stumps are rotten. Other cracks could have occurred before a home was re-stumped and just need to be patched. Mr Inspector will ascertain what the problem is and what needs to be done. The importance of engaging an experienced and knowledgeable building inspector will mean you will have these issues assessed and be given the correct information on how they need to be rectified. The above photograph was taken by Mr Inspector during a building inspection in Sandringham. In Victoria, even though a house inspector doesn't need to be qualified, Mr Inspector is the only qualified building inspector operating out of the Sandringham and Black Rock areas so you can be assured you are getting an experienced and knowledgeable building inspector carry out your Building Inspection. The photograph depicts a rafter in the roof that has cracked in a house in Sandringham A roof cavity inspection is imperative due to the fact no one really goes into this area to inspect. Common defects are insulation being too close to the down lights which is a fire hazard, ageing of timber roof frame and batons and cracked or deteriorated roof cladding. This photograph above is of a common rafter that has snapped. This is a structural member in that it is carrying or supporting roof batons and the roof cladding, hence this is a structural defect. This will be quite difficult to rectify as the rafter may require removal. A carpenter may be able to laminate similar timber species to the side of the rafter once the roof is re-leveled, however, this would need to comply with a structural engineers specifications. A qualified and thorough building inspector would detect this defect and advise accordingly. This shows the importance of obtaining a qualified building inspector to assess your potential home before you buy. 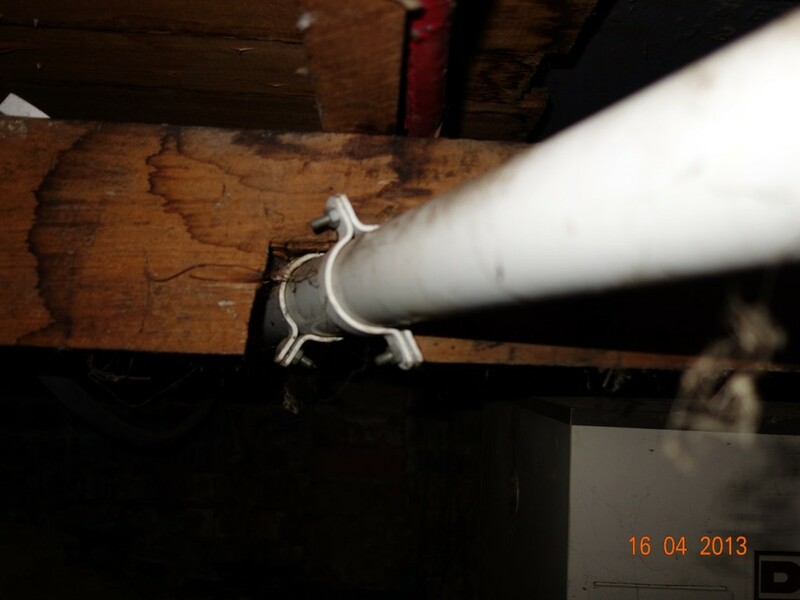 Without a qualified Building Inspector in Brighton thoroughly going over your potential home, defects may go unnoticed and you will soon find that they could cost you a small fortune to rectify as indicated by this photograph taken during a recent building inspection in Brighton. The building inspection photographs is depicting timber decay in the stump footings which is classified as a structural defect. The timber stump footing will require replacement with concrete stumps at a cost of around $15,000 and if not picked up during the building inspection process you would be in for a disappointing surprise. This defect is a fault of deviation from its intended structural performance and hence, a structural defect. A thorough building inspection of accessible areas under the home is essential to check for footings rot under the home.